MRI pretreatment scans from two glioblastoma patients with similar proliferation values. The first patient (top three images) has an IDH1 mutation and the second patient (bottom three images) does not, illustrating the more diffuse nature of IDH1 mutant tumors. A tumor growth model developed by Northwestern Medicine scientists can identify a gene mutation that is associated with a favorable prognosis for glioblastoma patients. Glioblastoma is an aggressive and incurable type of brain tumor, but a mutation in the IDH1 gene increases the median survival rate from 1.1 years to 3.8 years. However, in the past physicians could identify the mutation only through a biopsy conducted before additional surgery to remove the tumor. Using mathematical modeling methodology, Swanson’s lab builds models to predict tumor growth in individual patients. 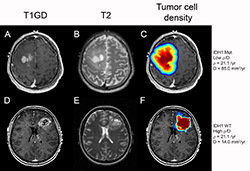 “We take MRIs and other information about the patient and tune a model to tell us where a particular patient’s tumor will physically go over three months, six months, nine months,” said Swanson, a member of the Robert H. Lurie Comprehensive Cancer Center of Northwestern University and the Northwestern Brain Tumor Institute. This time, she focused on the IDH1 mutation, looking specifically at the ratio of two measures: proliferation and diffusion of the tumor cells. 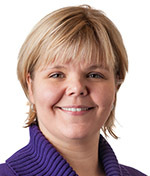 Kristin Swanson, PhD, professor in Neurological Surgery and Engineering Sciences and Applied Mathematics, uses MRI scans and mathematical modeling to predict brain tumor growth. The findings were published in Neuro-Oncology. Comparing scans from 172 patients, the scientists found that tumors with the IDH1 mutation appear more diffusive – more spread out and invasive – but less aggressive than non-mutated ones. To use the model, physicians need only the two types of pretreatment MRI scans every potential brain tumor patient receives, gadolinium-enhanced T1-weighted and T2 MRIs. “There’s a lot of day-to-day clinical data that’s being handed to physicians. The whole idea behind mathematical neuro-oncology is to structure all that information in a quantitative way so it can be used to best benefit each patient,” said Swanson. Continuing that theme in another recent study, Swanson’s lab used its modeling methods to examine how gross total resection – surgery that removes all parts of a tumor visible in an MRI – increases survival in patients with steep knot-like tumors versus shallow and diffuse tumors. The IDH1 mutation study was supported by the James S. McDonnell Foundation, the University of Washington Academic Pathology fund, the National Institutes of Health grants U54 CA143970, NS060752 and R01 CA16437, the James D. Murray Endowed Chair in the Nancy and Buster Alvord Brain Tumor Center at the University of Washington, the Northwestern Brain Tumor Institute, and the Zell Scholars Fund and Wirtz Innovation Fund at Northwestern University.